Chakkakuru (Jackfruit seeds), Manga (Raw Mango) curry with Muringakka (Drumstick) is a seasonal dish in Kerala which needs no introduction to any Keralite. Its prepared usually in the pre monsoon period which is the jack fruit season in Kerala. 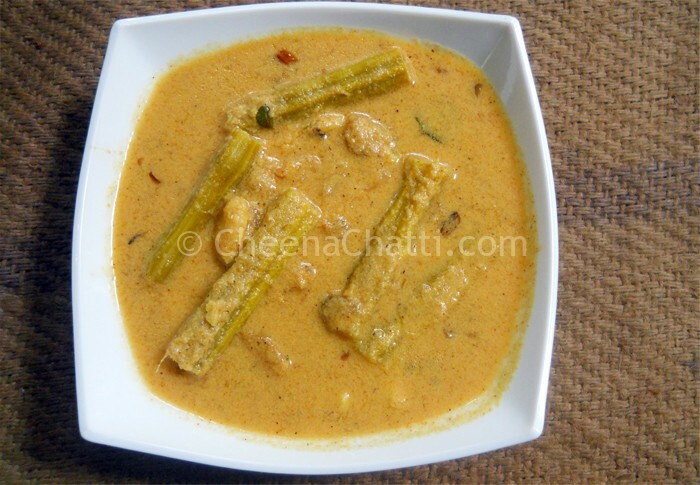 This is one of the most popular dish in every Kerala kitchens and its an easy to prepare dish. Pressure cook the jackfruit seeds, together with a little turmeric powder and dry prawns for up to 3 whistles. After 3 whistles turn of the flame and allow the steam to escape. Heat the clay pot and when it becomes hot, add the cooked jackfruit seeds, drumstick pieces and dry prawns to it. Add the mango pieces also and cook it in 1/2 -1 cup of water, keeping the lid covered. Grind the scrapped coconut, green chillies, shallots, cumin seeds and the ginger into a smooth paste in a mixer. Add the coconut paste (#2) to the curry in the clay pot and cook it for 2-3 minutes under medium / low flame. Add salt, stir it and cook till the gravy becomes little thick. Heat a pan and pour the coconut oil. When the oil becomes hot, splutter the mustard seeds and saute. When the mustard starts cracking add the curry leaves to the pan. Serve it hot / after 3 minutes along with Rice. This entry was added on June 21st, 2013 by Reeja MytheenKunju in Vegan and tagged with jackfruit seed and mango curry, chakkakuru curry recipe, jackfruit seed curry, kerala jackfruit seed recipe, raw mango drumstick curry, chakkakuru mango curry recipe, jackfruit curry, how to make jackfruit seed curry, kerala curry. Last revised on March 29th, 2018.